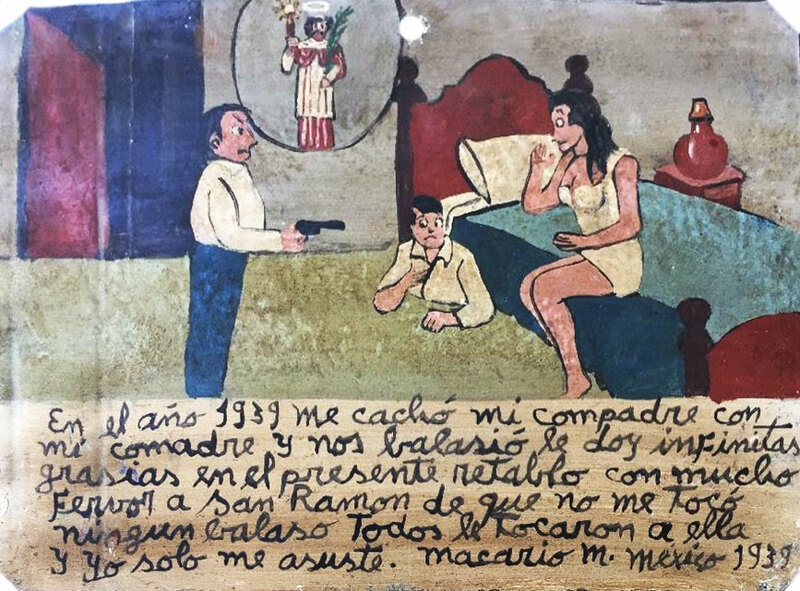 1921, in San Lorenzo my buddy caught me on the mat with his wife. He started to shoot at us. I give infinite thanks to St. Raymond because bullets didn’t hit me. She took them all. R. S. was addicted to sleep with many men at the same time. 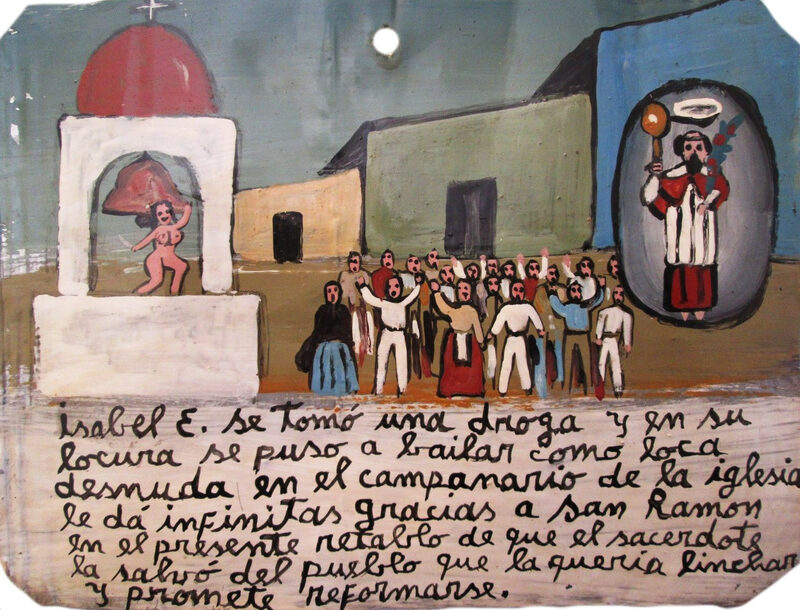 With the present retablo, she thanks Saint Raymond for giving her enough willpower to overcome her perversion. I was going out with two guys at the same time because I couldn’t decide whom to choose for a boyfriend. I was thinking they would find out, but last Saturday I went to the movies with one of them and there I saw, to my fear, my second suitor sitting right in front of us. I thank Saint Raymond because he was so entertained with the movie he didn’t see me with another guy and didn’t find out about my cheating. R. was about to get married when his actual wife appeared, and it was bad. He was accused of bigamy. He thanks Saint Raymond for solving this problem. He did his punishment and promises to amend. 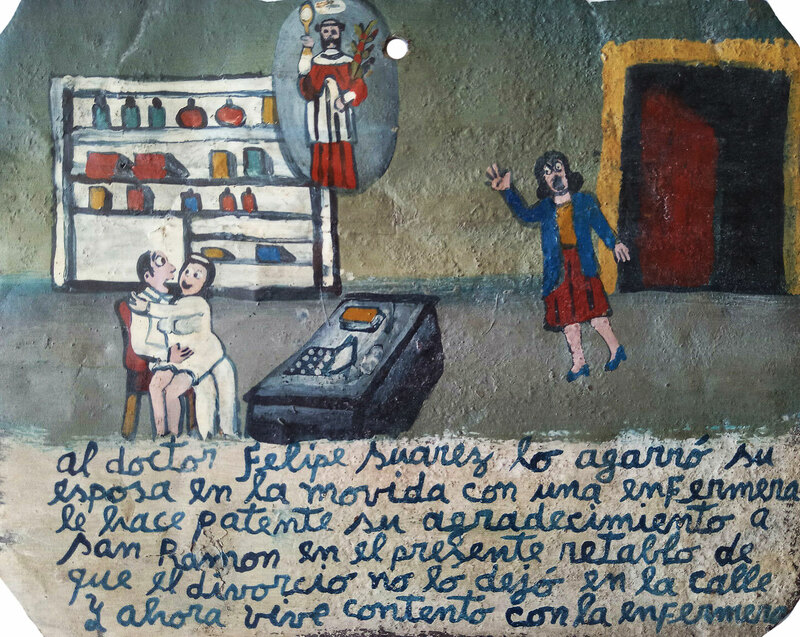 The doctor Felipe Suarez was caught in action with a nurse by his wife. 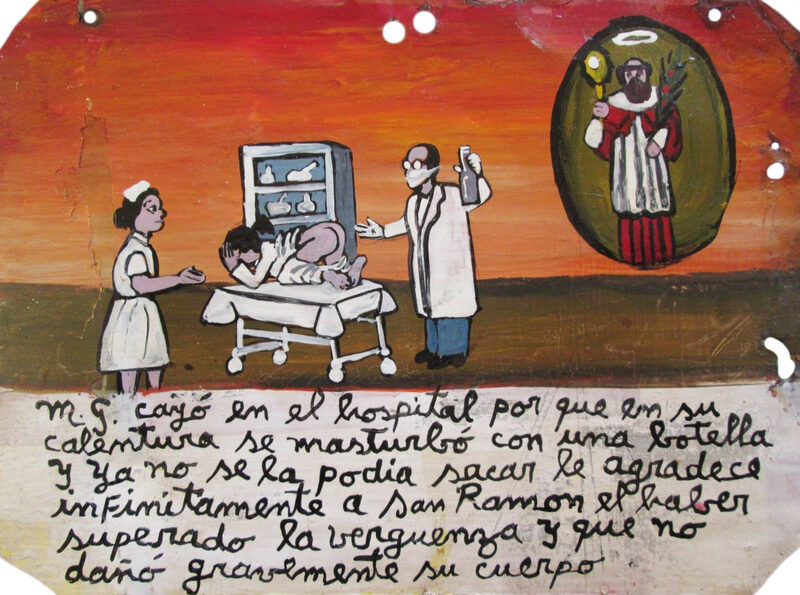 He thanks Saint Raymond with the present retablo for the divorce didn’t ruin him completely and now he lives happily with the nurse. 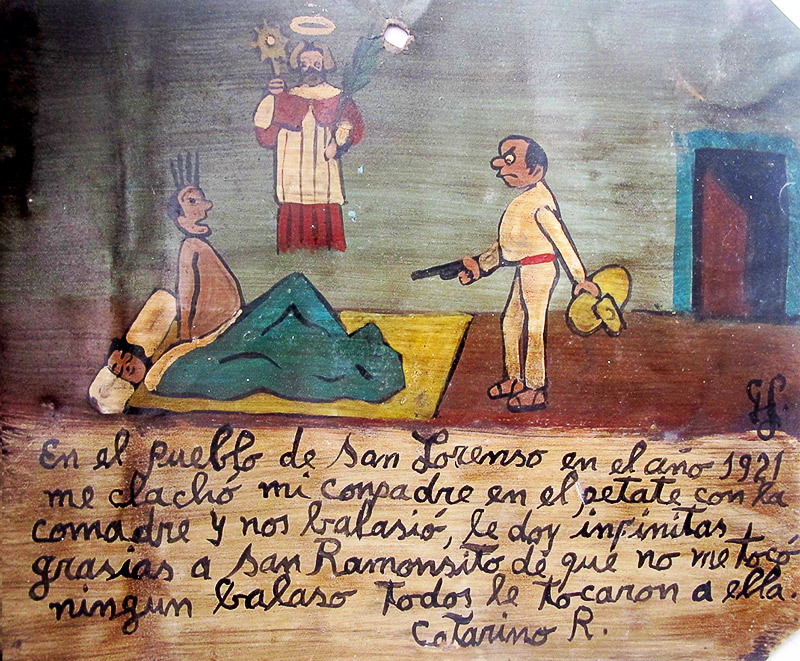 I used to drink pulque with my buddy every day, but one night that witch my mother-in-law and my wife kicked me off the bar with their brooms. I thank Saint Raymond for I didn’t become an idiot after so many blows since that old nag was absolutely furious and was hitting me with all her might. I promise to stop drinking because it’s better to not mess with these women. 1939, my buddy caught me with his wife. He started to shoot at us. I give infinite thanks to Saint Raymond because bullets didn’t hit me. She took them all, and I only got scared. 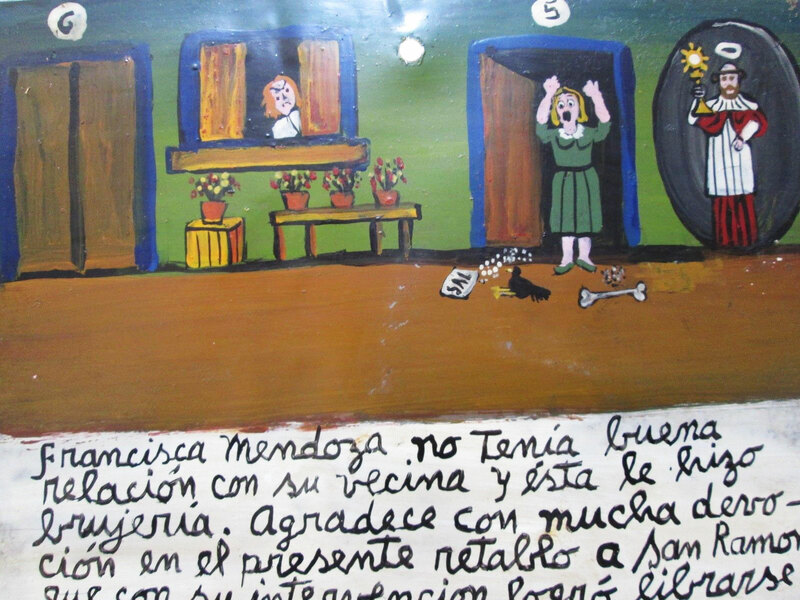 Francisca Mendoza didn’t have good relationship with her neighbor who even used witchcraft on her. 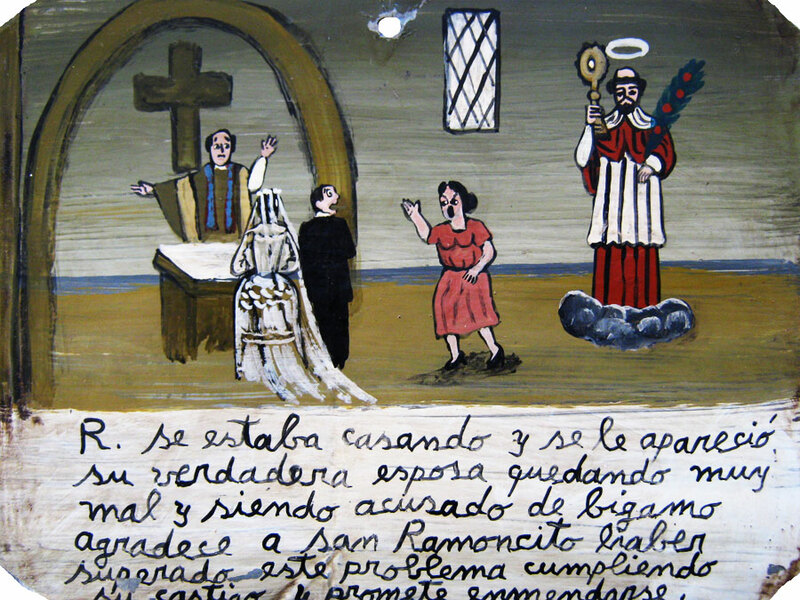 She thanks Saint Raymond with the present retablo because she managed to get rid of the neighbor with his intervention. 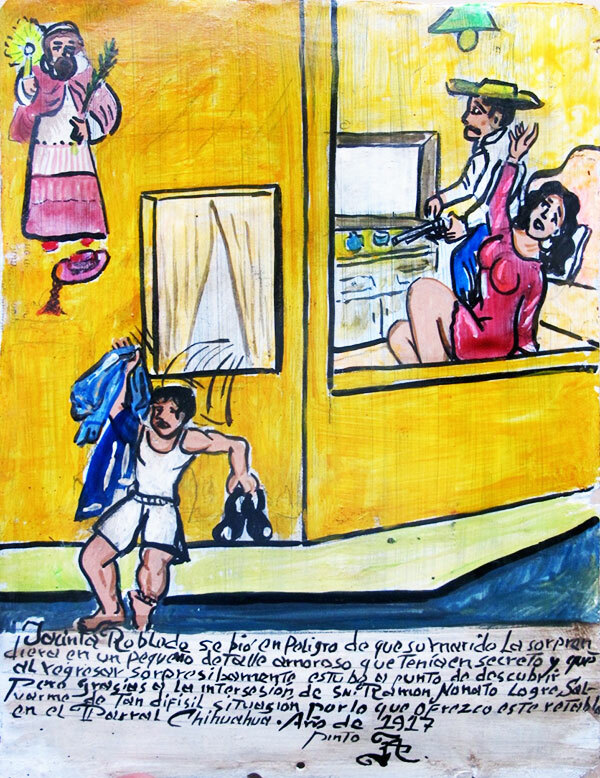 Jasinta Robledo found herself in a dangerous situation when her husband almost found out about her small secret affair. The husband suddenly came home and almost caught them, but thanks to the Saint Raymond’s intervention Jasinta came through this difficult situation. 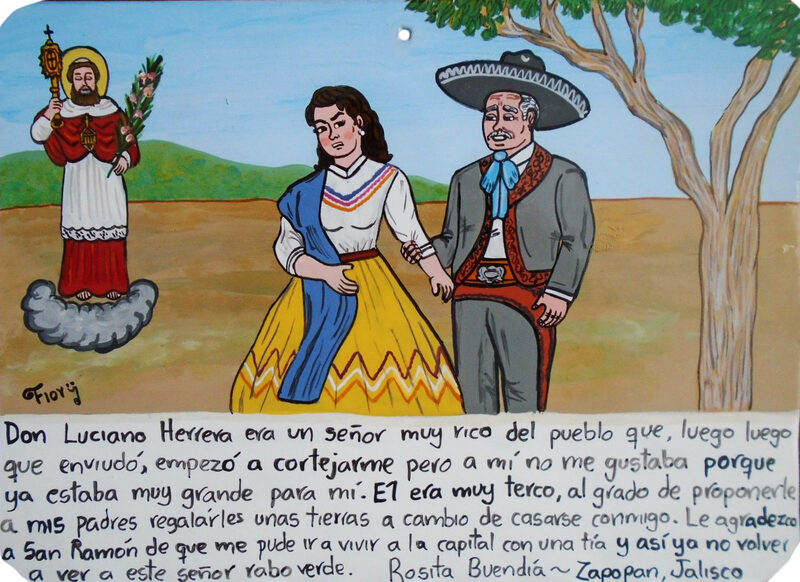 She offers this retablo for that.